Home » General Health » Is Red Meat Killing Us? Okay: you’ve heard all the bad press about red meat. It’s high in saturated fat and that makes it a dangerous food for your heart. Too many saturated fatty acids in the body have been linked to a higher risk for heart attacks and strokes. When you eat a lot of red meat, you’re boosting not only your saturated fatty acid intake, but also the production of cholesterol in your body. Once eaten, these saturated fatty acids clump together and when that happens, they can become lodged in your blood cells and organs—a recipe for disaster as far as your health is concerned. Along with heart disease, obesity can become a chronic problem. Your risk for certain cancers could go up, too. And yet, despite this, saturated fat is not all bad. In fact, some of it is good for you. Saturated fats do exert a number of beneficial effects in the body. Saturated fat may boost liver health and promote bone strength. It plays a role in the proper functioning of your nervous system and in the maintenance of your immune system. Perhaps most importantly, saturated fat is good for your brain, in part because your brain is made of fat. Without saturated fat, your brain can’t function properly (this is why, incidentally, fat-free is not always the way to go when dieting). All those beneficial omega-3s that you’re trying to get into your diet by eating flax seeds can’t be used by your body unless you have some saturated fat. So is saturated fat good or bad? It’s a good thing, provided you eat small amounts of the right saturated fats such as organic butter or virgin coconut oil. Which brings us back to our original discussion of red meat: if saturated fat is good for you on some level, then why is red meat being flagged as a health hazard by so many clinical trials? It could be that it’s not saturated fat at all that’s causing health problems, but a substance called L-carnitine. A new study has just been published that offers an explanation of how L-carnitine behaves in the body. 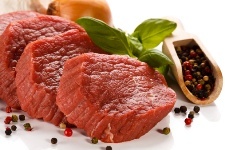 When you eat red meat containing L-carnitine, it travels to the stomach where it comes in contact with bacteria. The bacteria breakdown L-carnitine and turn it into trimethylamine-N-oxide. This compound triggers atherosclerosis, which then ups your risk for heart attacks. In effect, if you were to eat L-carnitine every day, more and more cholesterol would be deposited onto your artery walls, while at the same time, less and less would be removed from your body. Does this mean it’s really L-carnitine that you want to avoid? Some have already cautioned that taking L-carnitine supplements may not be a good idea in light of the results of this clinical trial. Other than that, stick with the sound advice of eating red meat in moderation. Cut back if you eat red meat regularly. And do what you can to stay away from processed meat. Not that processed meat is high in L-carnitine—it turns out that red meat probably contains more of the substance—but salamis and sausages are usually high in sodium which can cause your blood pressure to go up. Pendick, D., et al, “New study links L-carnitine in red meat to heart disease,” Harvard Health web site, April 17, 2013; www.harvard.edu, last accessed June 17, 2013. Murphy, A.J., et al., “Cholesterol efflux in megakaryocyte progenitors suppresses platelet production and thrombocytosis,” Nature Medicine; 19: 586–594. “Get Saturated: Four Reasons Saturated is Healthy,” Natural News web site, January 4, 2010; www.naturalnews.com, last accessed June 17, 2013.